The Ohio Organizing Collaborative's unique model combining policy analysis with community, electoral and movement organizing is beginning to bear fruit. Retail workers organizing for higher pay and union recognition. Rural communities resisting environmental consequences of the fracking boom. Racial justice protests over the non-indictment of a police officer who killed an unarmed black man or woman. Each is fast becoming a fixture in our country’s growing progressive political subculture. In Ohio, one activist organization, the Ohio Organizing Collaborative, or OOC, has its hands in all three. OOC organizer Mercedez Guy is helping Walmart workers join the Organization United for Respect at Walmart, or OUR Walmart, to bargain for higher pay, improved working conditions and union recognition in six stores in the vicinity of Dayton. 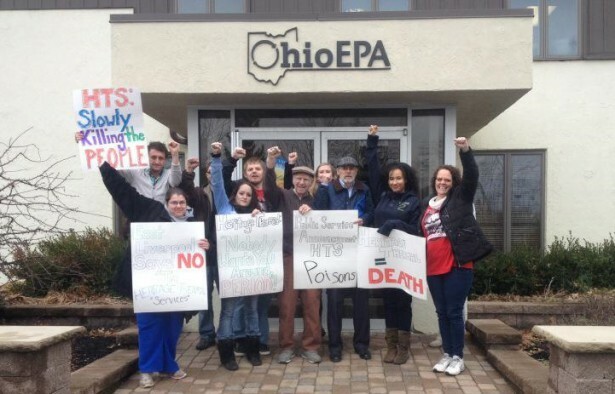 Lead organizer Caitlin Johnson and Communities United for Responsible Energy, or CURE, are organizing community responses to environmental and infrastructure problems created by the fracking boom in Northeast Ohio. And the Ohio Student Association, or OSA, which has been organizing and educating around higher education accessibility and the school-to-prison pipeline throughout the state for a couple of years now, have helped facilitate community calls for police accountability for the killing of the unarmed 22-year-old John Crawford in Beavercreek and 12-year-old Tamir Rice and 37-year-old Tanisha Anderson in Cleveland, both also unarmed. The origins of the Ohio Organizing Collaborative date back to a 2007 convening of labor and faith activists and community organizers, according to Kirk Noden, the OOC’s executive director. A group of around a dozen people — from organizations including the United Food and Commercial Workers International Union, ACORN, the Ohio Baptist State Convention and the Amos Project — took stock of the kind of power they had built and victories they had won over previous decades. Being painfully honest with themselves, they could not avoid the conclusion that they were losing on all of the issues they care about — worker rights and opportunity, structural racism, the elimination of poverty, and the list went on. The OOC seeks to create an environment where people working on different progressive causes can relate to each other on transformational rather than transactional terms. The transformational element entails both connecting different, otherwise insular, strands of progressive organizing in sustained strategic partnerships as well as seeding new organizations, especially for issues that are underdeveloped in Ohio. CURE was founded in 2013 for the latter reason, and the OSA began receiving financial assistance in 2011 to facilitate the development of a statewide student network. The goal is the creation of what Noden calls a progressive “ecosystem” that can expand itself and begin to stand up to, and hopefully begin to turn back, similar conservative infrastructure that began to be developed on the state and national levels in the 1970s. Essential to the OOC’s ambitions is its creation of a central fundraising mechanism — a C3 and C4 non-profit. According to Noden, over half of the OOC’s funds are raised through grants from both Ohio-based and national foundations, like the George Gund Foundation and the Ford Foundation, respectively. About a quarter comes from labor groups, and around 15 percent from individual donors and membership dues. The centralized fundraising mechanism is used to develop decentralized organizing outfits intent on building large, engaged bases. Through groups doing community organizing and education around common sense issues with populist appeal — everything from income inequality, mass incarceration and structural racism, to climate change and environmental degradation — the OOC hopes to escape the political margins within which progressivism has been confined in recent decades. The OOC now has 19 member organizations. In addition to CURE, the OSA, the Amos Project, and the Ohio State Baptists Convention, members include a host of city and county community organizing outfits throughout the state; policy groups like Policy Matters Ohio, the Ohio Justice and Policy Center and the Kirwan Institute at Ohio State University; labor organizations, including UFCW Local 75, SEIU Local 1, Communication Workers of America Local 4, the Farm Labor Organizing Committee and the Ohio Iron Workers District Councils; a faith group, Our Prophetic Voices; and a worker-owned agricultural cooperative network, the Cincinnati-based Our Harvest Cooperative. The OOC also works under the banner of Stand Up for Ohio in conjunction with the national organization Center for Community Change. The organization pursues four basic streams of work: traditional community organizing, movement building. large-scale electoral work, and coordination of the three organizing streams with progressive policy analysis. The OOC’s electoral organizing seeks both to educate citizens on important ballot initiatives and to build an electoral base that can elect candidates championing OOC-backed causes. “We want to build independent power in the state outside the Democratic Party that can really be a left pole in politics,” Noden said. The Stand Up for Ohio campaign in 2013 against House Bill 203, which would have expanded Florida’s “Stand Your Ground” law to Ohio, is a good example of the integration of electoral work and activism that the OOC promotes. The OSA had been educating the public about “Stand Your Ground” throughout the George Zimmerman trial. When Ohio Rep. Terry Johnson, at the behest of state-centric conservative groups like the American Legislative Exchange Council, introduced HB 203 in the immediate aftermath of the Zimmerman acquittal, an opposition electoral base had already begun to be developed. The OSA’s efforts, which culminated in a die-in outside the state capital, helped the campaign force the removal of the “Stand Your Ground” provision from the bill. The OOC’s policy work serves to support existing campaigns and to help to expand knowledge about social problems. For example, Policy Matters Ohio will frequently publish fracking impact assessments for various Ohio counties, while the Kirwan Institute published a review of implicit racial bias and a policy proposal for equitable neighborhood development on Columbus’ Southside last year. Both the CURE and OUR Walmart organizing are examples of traditional community organizing, which often seeks to win local fights on issues like the fair treatment of workers or affordable housing, while the OSA’s organizing around the Black Lives Matter protests is an example of the movement building made possible in moments of broad public engagement. CURE works with grassroots partners in communities affected by environmental degradation, most of which is related to the fracking boom in the Utica and Marcellus Shale in east and northeast Ohio. Some communities seek to redress environmental problems, such as air and water pollution, or hazardous waste. East Liverpool, a city where CURE is active, is home to one of the world’s largest hazardous waste incinerators. Other communities seek to deal with stress caused by the fracking boom, like increased traffic and accidents involving hazardous materials due the transportation of shale, or the rises in local housing prices caused by the influx of energy industry workers, which has created shortages of affordable housing. Most of the energy workers are hired from out of state, and many, according to Johnson, are undocumented immigrants from Mexico or Central America. Accordingly, CURE’s campaigning has focused on both limiting environmental degradation and directing financial resources to affected communities so they can adapt to changed circumstances. CURE helped to defeat HB 490, which would have allowed energy companies to bypass local first responders when disclosing chemical information. It is pushing for an increase in the tax on production paid by energy companies, so that revenue can be redirected to affected communities. CURE is also opposing legislation that would allow First Energy to increase its electricity rates, which the company seeks in order to cover high production costs at its coal plants associated with the failure to invest in new clean technology. In addition to expanding the OOC’s statewide presence into environmental issues, CURE is organizing in communities that are not traditionally progressive. The idea of being an activist is not widely embraced in many of these communities, according to Johnson. Many people in the communities are conservative — some are involved with or oriented towards the Tea Party. And in many communities “War on Coal” signs can be seen in public, an allusion to the historical economic and cultural significance of coal mines in their communities. Similarly, Guy is organizing Walmart workers near Dayton, a group of workers that is largely not politicized despite low pay and poor working conditions. Guy encourages the workers to join OUR Walmart and helps the workers collectively address problems in their stores. They often collect signatures to address issues like a change in the dress code that the workers are expected to pay for out of pocket, a request for a holiday bonus, or reinstatement for a wrongful termination. Support from the group when announcing grievances to management is important for the workers, according to Guy, because Walmart’s “open door policy” typically results in intimidation behind closed doors. Sometimes the workers strike in support of the grievance for which they seek redress. They also usually participate in the national OUR Walmart strikes, which, according to Guy, typically occur in June and around Black Friday. OOC partners usually join in the picketing, where workers disseminate handbills with information to customers. Yet many workers remain unwilling to join, either due to fear of management retribution or gratitude toward Walmart for employing them. Guy estimates around 30 workers are members of OUR Walmart spread throughout the six stores on which she focuses. She spends significant time educating workers about the economics of their situation. Many are unaware that Walmart made $17 billion in profits in 2013, that CEO Mike Duke was paid $23.2 million in 2012, 1,034 times more than the company’s average worker, or that Walmart cost tax payers $6.2 billion in 2013 due to the federal assistance needed to subsidize its workers’ poverty incomes. The pay raise Walmart recently announced will empower the workers already involved and ease the skepticism of many on the fence. It also helps that a local worker, Kelly Sallee, was featured in the New York Times coverage of the announced raise. Managers will also use the raise to show the workers they are responsive to their demands, Guy argued, which will support their contention that a union is not necessary and that OUR Walmart is just trying to steal the workers’ money. The work the OSA has done around the Black Lives Matter protests is an example of the type of movement organizing the OOC seeks to support. Movement organizing entails capitalizing on catalyzing moments in which the broader public is aware of and ready to act upon an issue. Capitalizing on these moments requires a flexible organization capable of quickly training and educating people and organizing actions in which they can participate. 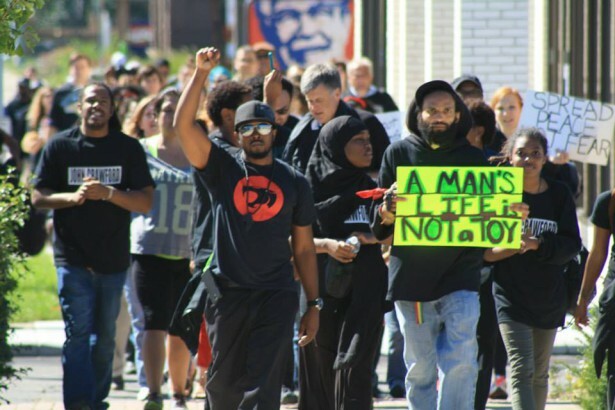 The OSA organized a community response to the killing of John Crawford, an unarmed 22-year old black man, in Beavercreek on August 5. Crawford was killed in a Walmart where many OSA members frequently shop, since the organization has an active chapter at nearby Wright State University. In September they marched from the Walmart to the Beavercreek police station, where they camped out for three days before the Ohio Attorney General Mike DeWine agreed to their demand of releasing the tape of the killing. Walmart’s internal security cameras had captured the video. “The Attorney General did not want a Ferguson here,” said Stuart McIntyre, the OSA’s executive director. The group is currently waiting on a federal investigation into the killing to release its findings. These movement moments provide the opportunity to engage the broader public, which might not otherwise be aware of or receptive to activism, and to significantly build an organization’s base. Both McIntyre and Noden point to the Occupy movement as evidence of the power of such moments. The transformative potential of these moments stems from the opportunity they present in terms of popular education. Power dynamics can shift within a previously generally unaware population if, for example, the killing of unarmed black men and women is not simply framed as an example of one flawed policy or brutality, but as the most visible element of a structurally racist societal system of resource allocation that underfunds public education and does not invest in full employment — problems which disproportionately effect the wealth-earning potential of racial minorities. The OSA offers a structural social analysis that contends capitalist economics and neoliberal politics essentially subvert the potential for democracy, as economic inequality makes impossible the political equality upon which any democracy is founded. In order to manage the different facets of its work, the OOC relies on four core teams: leadership, strategy, training and fundraising. Aside from the OCC’s commitment to maintaining a lean central bureaucracy, so that it takes as little money as possible from the operations of the member organizations, it is not devoted to any single organizational structure. It seeks to make decisions representative of its membership, but it also acknowledges that different tasks call for different types of organization. Influence within the organization is balanced between the different core teams, which was a decision made between two and three years ago. The leadership team is the central decision-making unit that directs overall strategy decisions. The team is typically comprised of five to 10 people who are either key organizers or staff members of organizations that are playing a key role or representing a core constituency. Noden currently runs the leadership team. Members of the OSA, the Amos Project, and the Akron-Canton Organizing Collaborative currently sit on the team. The strategy team is a more fluid unit that typically meets around four times each year, according to Noden. At times, the team has been comprised of as many as 30 people and as few as six people. Noden points to the organizing in opposition to the “Stand Your Ground” bill as an example of work done by the strategy team. Once the legislature proposed the bill, the strategy team decided OOC organizations could work together on the opposition and they directed the coordination between groups. James Hayes, political director of the OSA, and DaMareo Cooper, the OOC’s organizing director, currently run the strategy team. There are two key pieces of the training team’s work: a weeklong organizing training, typically during the summer, and more frequent locally-based movement and organizing training. Between the two, the OOC put over 2,000 people through formal training in 2012, a number that it hopes to continue to match annually. The weeklong organizing training typically attracts 100 people each year. The OOC’s primary training partner for the weeklong outfit has been ISAIAH in Minnesota. The training usually focuses on developing community organizing skills — integrating different organizing models; linking organizing work with policy work; creating space to build relationships at all levels; and building deeper collaboration between the core constituencies of community, faith and labor. It also touches on issues like race and class in America, building political consciousness, and broadening views of power with an emphasis on long-term movement strategy. The training team also facilitates local group training, including electoral campaign training, and has begun building a movement building training program. Some of the content for the movement building training has been developed by Center for Community Change and the New Organizing Institute. The OOC is in the process of developing a permanent core training team so that it can better incorporate training and education into everything that it does. The goal of the permanent core training team is essential to creating the capacity to capitalize on movement moments, like the Black Lives Matter protests. The fundraising team is comprised of around 10 people and it develops the fundraising strategy. It handles grant proposals for specific member organizations as well general operating grants for the OOC. The team begins the process of setting budgets for member organizations and general strategies, with an emphasis on subsidizing newer groups and strategies. The OOC is unabashed in its stated intention of building a long-term progressive revival in Ohio that is genuinely an independent source of citizens’ power. Its unique model of combining progressive policy analysis with its three strands of community, electoral and movement organizing has begun to experience success. The OOC has helped to oppose state legislation like HB 203, which would have brought “Stand Your Ground” to Ohio, and Senate Bill 5, proposed legislation backed in 2011 by Governor John Kasich that would have restricted the bargaining rights of public employees. It has helped to galvanize the Ohio faith community, in part by helping to develop Ohio Prophetic Voices, a statewide group of 150 faith and clergy leaders that has taken the lead in the immigrant Campaign for Citizenship in Ohio and the protection of the voting rights of all Ohio citizens. The OOC has also helped to earn significant criminal justice reforms with the state’s first fair hiring policy in Cincinnati in 2010, which eliminated the requirement for a criminal background check for city employees, making it easier for job seekers with felony records to be hired. Similar “Ban the Box” legislation has been passed on the municipal level around the state and statewide collateral sanction reform was passed in June 2012. The organization helped to secure Governor Kasich’s two-year Medicaid expansion in association with the Affordable Care Act. And it was the key advocate for securing $169 million through the ACA’s Balancing Incentive Payment Program, which well help to keep seniors and the disabled in their homes rather than in nursing homes that often happen to be more expensive. But most of these victories were defensive in nature, as they either stopped implementation of a conservative policy or earned rights or funding frequently enjoyed in other more progressive states. The OOC, however, has begun to implement new progressive infrastructure that could pay future dividends. It has helped to bring environmental and student organizing to Ohio, through CURE and the OSA, respectively. And it has vastly increased the amount of paid community organizers in the state. At its inception, the OOC only employed three organizers and ACORN, the only other group with an organizing presence in the state, according to Noden, employed an additional handful of organizers. Today the OOC has trained thousands of activists and employs at least 20 full-time organizers working on strategically targeted and coordinated campaigns. Has the movement to prevent gun violence hit a tipping point?